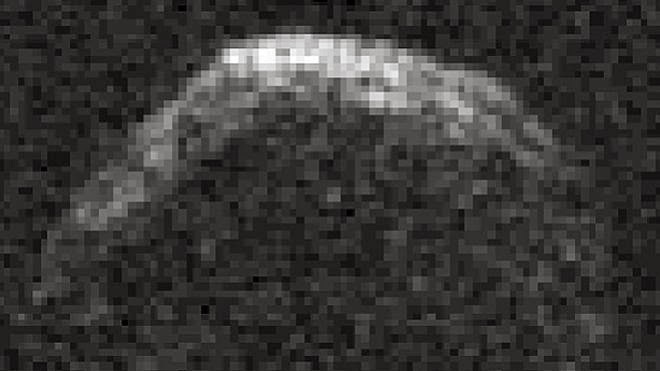 The image above was made from radar observations by the Arecibo Observatory in Puerto Rico in March 2001, when 1950 DA passed within 4.8 million miles of Earth. Is this the mug shot of a future continent-killer? Radar analysis and research of 1950 DA performed by NASA’s Jet Propulsion Laboratory scientists J.D. Giorgini, S. J. Ostro, Don Yeomans and several others from JPL and other institutions revealed that the impact probability from 1950 DA in March 2880 is, at most, 1 in 300 based on what is known about the asteroid so far. There are many factors that influence the path of an asteroid through space. Its spin rate, reflectivity (albedo), composition, mass, terrain variations… gravitational interactions with other bodies, some of which may not even have been discovered yet… all of these can affect the movement of an asteroid and, more specifically, its exact position at a future point in time. While many of these things still aren’t precisely known for 1950 DA, one in particular could end up being the saving grace for our descendants: the Yarkovsky effect. A small but important force acting upon asteroids, the Yarkovsky effect is a “nudge” created by thermal emission. As an asteroid gathers heat energy from the sun, it releases some of that energy back into space. Thanks to Newtonian mechanics the sheer act of doing so creates a physical push back on the asteroid itself, altering its course ever so slightly. Over a long span of time, this slight alteration could result in the relocation of 1950 DA away from the spot in space where Earth will be on March 16, 2880… at least enough so that a miss is certain. So what would happen if the half-mile-wide 1950 DA were to hit Earth? While that depends on a lot of things, such as its composition, speed, angle of impact, where it impacts, etc., needless to say it would cause a lot of damage across a large area. I’m talking an energy release upwards of half a million megatons, which, were it to strike say, New York City, everything within at least a 100-mile radius would be flattened by the force of the impact alone — that’s halfway to Boston and Washington, DC. And that’s not even taking into consideration the air blast, atmospheric dust cloud, secondary impacts from debris, or damage from any resulting tsunami (if the impact were in the ocean)… the destruction would easily extend out many more hundreds of miles, and the repercussions — physical, financial, economic, and emotional — would extend around the globe. But again, precisely where 1950 DA will be in another 866 1/2 years (and whether or not it will occupy the same point in space as our planet) relies on many factors that aren’t well known — even though its orbit is pretty well understood. More in-depth observations will need to be made, and that is why asteroids like this must be carefully — and continually — watched.